Happy New Year everyone! As January hits, we all start thinking about our goals and aspirations for the year ahead of us – “new year’s resolutions”. Losing weight and eating healthy are commonly on the top of most men’s resolution list for the year. These goals are usually attainable if you are realistic and willing to work hard; living a healthy lifestyle and maintaining a healthy weight will always be in style. Reaching such goals may take some time however, so try trimming down with some wardrobe fixes. Wear clothing that actually fit – Garments that are too baggy or to tight add pounds. You should be able to fit your thumb inside of your waistband without inhaling, but only your thumb. Similarly, your shirts should be as fitted as possible, without causing the fabric to stretch or pull (creating whisker-like lines). Taking a look at the shoulders is a good way to make sure your shirt is fitting properly. The shoulder seam should be flush with your natural shoulder line. If this is the case and the body of the shirt is still baggy, look for a slimmer cut or have a tailor take it in, rather than going down a size. Infuse point into your necklines and collars – Crewnecks as well as spread collars widen and broaden your torso, and showcase roundness in your face. Opt for v-necks and point-collars to look taller, leaner, and minimize any roundness in your face and jawline. Less buttons – Jackets with less buttons actually form a deeper “V”, creating a slimming and narrowing illusion. Limit contrast – Limiting the contrast between your upper and lower half will create a more fluid line for the eye to follow, rather than chopping your body in half. Full suits and complimenting shoes create this look by default, but when a suit doesn’t fit the occasion try limiting the contrast between shirt, pants, and shoes. Use stripes – Vertical stripes guide the eye up and down, creating a slim contour. Pin stripes in your suit, stripes on your shirt, and crease lines in your trousers all help create this lengthening illusion. Trash the pleats – Pleats only create volume around your waist by adding extra material. Look for flat front pants, which will showcase a slim waist and disguise a larger one. Ditch the statement belt – A large belt buckle with detailing becomes a focal point, highlighting guts and stomachs alike. Tone down the belt and watch the pounds shed. 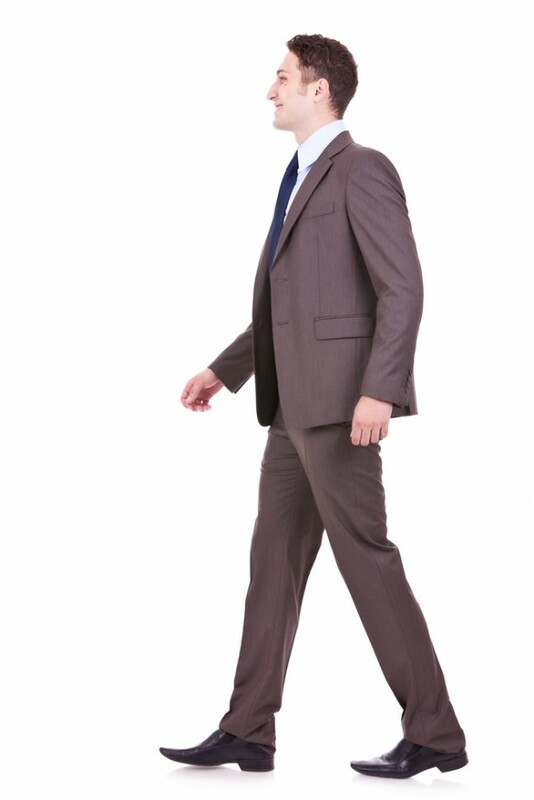 Posture – Standing up straighter with your head held higher will create length and height, making you look slimmer. As an added benefit, this will also help you exude self-confidence and power.